Grow Your Own Mushrooms Kit! 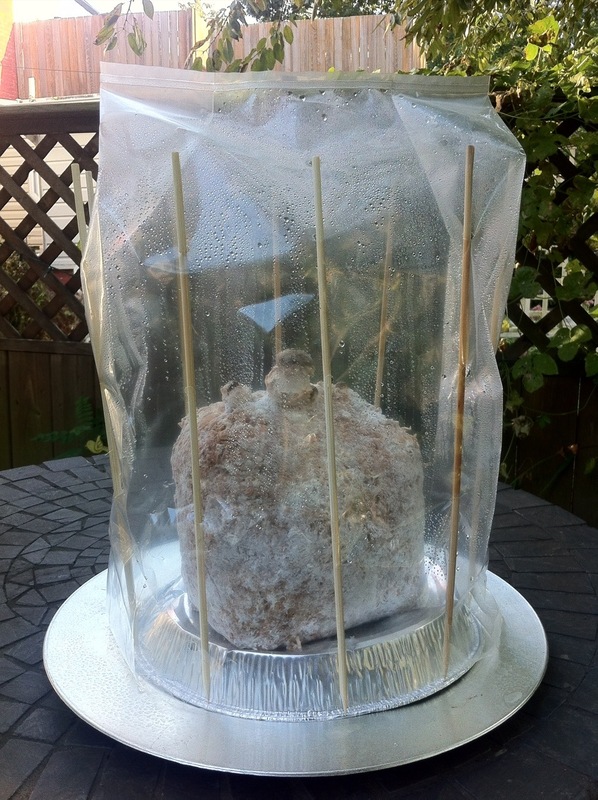 The block of growing material is inoculated with the mushrooms spores of your choice and mailed to you in a plastic bag. You remove the block from the bag and place it on an upside down pie plate – or something similar – but a pie plate was suggested. I’m guessing because it is going to get pretty gross and fungus covered… so you’ll probably just want to toss whatever you have the block propped up on. You cover it with a different plastic bag that has holes in it for air to go through. We propped up ours with bamboo skewers because it is not supposed to touch the block of growing material. The whole thing gets misted two times a day, the growing material and the inside of the plastic. The environment is supposed to stay moist, like a little fungus terrarium. 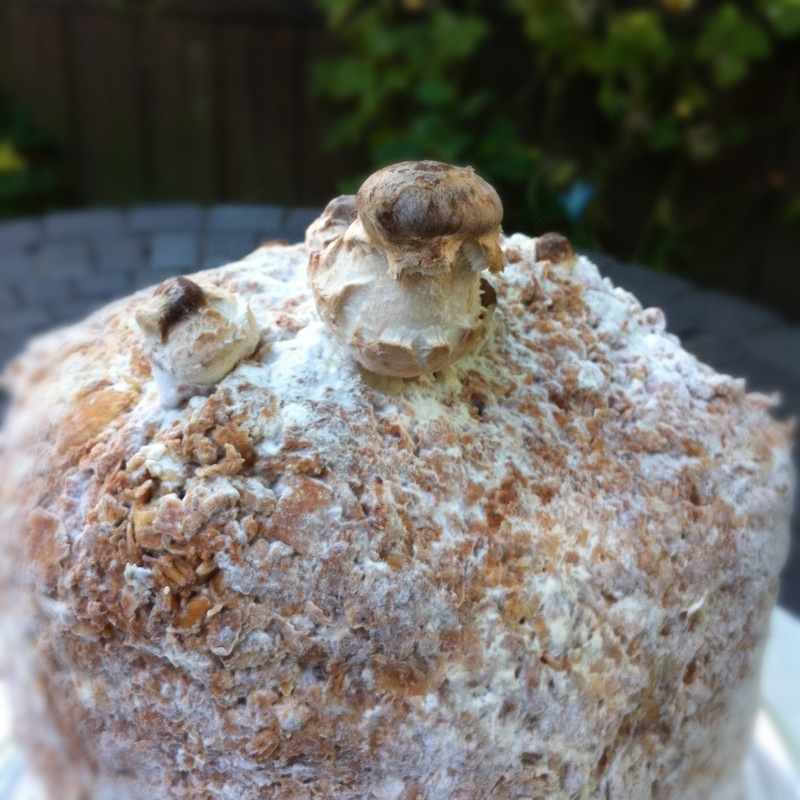 I would like to try to DIY this if I could get the mushroom spores. I think the block of growing material looks just like spent grains from when we brew beer. 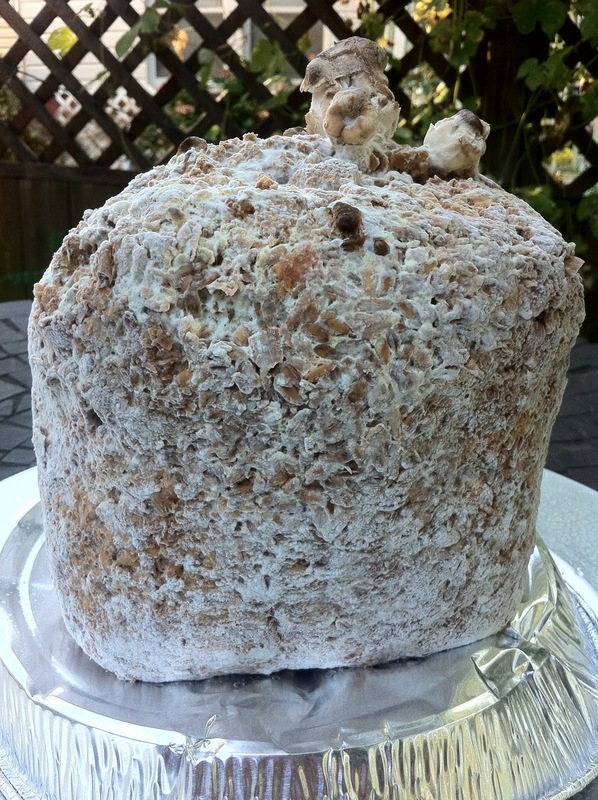 There’s always a lot of spent grains, so if I could use them to grow mushrooms it would be pretty awesome. I have to do more research on what would go into making my own block of growing material but I am going to try in the near future.I might just have some giant portabellas growing on the counter. Another really cool thing about this mushroom growing kit is that it will produce about three bunches for mushrooms on this block. Once it seems to not be producing any more you could spread it on a small area of your yard. The mushrooms will grow there if the conditions are right. I am really excited to cook something with my first batch of grown-on-my-kitchen-counter mushrooms. I’ll keep posting updates of the growing process!